President Goodluck Jonathan on Friday said that there had not been any free and fair elections in the country since Nigeria’s independence in 1960, as what had been happening since then was that people have been “buying and selling votes.”Jonathan, however asked Nigerians especially the youths not to allow anybody to buy their votes during the forth coming elections as this would not be allowed to continue. .He spoke at Abakaliki, the Ebonyi State capital, while addressing a large crowd of party supporters at the Abakaliki Township Stadium in the course of his nationwide wide campaign. Jonathan who is also, the presidential candidate of the ruling Peoples Democratic Party, PDP, wished that he would live to see a woman emerge as the president and as a governor in the country, pointing out that this was the major reason he had deliberately appointed women into prominent positions to expose and prepare them for greater challenges ahead.However, his chief host and governor of Ebonyi State, Chief Martin Elechi was prevented from speaking during the rally by the restive crowd which booed and heckled at him most of the time. Sources said that Elechi must have been disallowed from speaking by the crowd, due to the bad blooded generated during the gubernatorial primary which saw the emergence of his deputy, Mr Dave Umahi as the candidate of the party instead of his preferred candidate, Professor Onyebuchi Chukwu, the former minister of health.Elechi pitched his tent with Chukwu while the Secretary to the Government of the Federation, SGF, Senator Anyim Pius Anyim and other political bigwigs in the state supported Umahi. 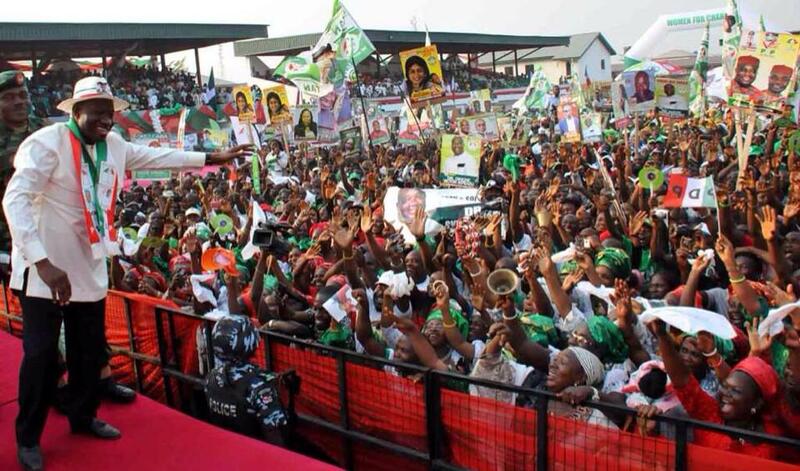 However, Jonathan who was accompanied to Abakaliki by the Vice President, Namadi Sambo, his wife, Patience, the National Chairman of the PDP, Adamu Muazu, the Director General of the PDP Presidential Campaign Organisation, Dr Ahmadu Ali as well as the Deputy President of the Senate, Ike Ekweremadu promised to ensure that Ebonyi always got its share from the federal government.Addressing youths whom he said were the leaders of the next generation, Jonathan emphasised that they must not allow themselves to be to be bought over by politicians who do not mean well for them. “Our campaign is for the young people. Our time is almost gone. We must change our circumstance. The young people should join us. Nobody should deceive you; nobody should buy your votes. Since 1960, we have been buying and selling votes and we don’t want to continue like this. If you want development, you have to join PDP to develop” he said. 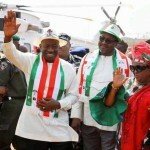 Speaking on the position of women, Jonathan said women would continue to play pivotal roles in his government.“For women, your vote is crucial. We have given identity to Nigerian women. This is not the end. We want Nigerian women to be paraded at the global level. We must expose our women.“This is the only administration that is ready to give every position to women. My aspiration is to see a female president before I die,” he further noted. He also noted that the development challenge facing Ebonyi, was daunting, being one of the last states to be created along with his home state of Bayelsa, by the military administration, adding that the Federal Government would rely on the state to ensure that its policy of stopping the importation of rice into the country in the next four years was achieved. Jonathan, had earlier paid homage to the traditional rulers in Ebonyi State at the International Conference Conference Centre where he told them that he was in the state to solicit the support of the people for the forthcoming elections. In his remarks, the Director General of the PDP Presidential Campaign Organisation, Dr. Ahmadu Ali said he was very proud of Ebonyi State because of their warm reception of the campaign team. The SGF, Anyim Pius Anyim told the crowd that Jonathan deserved their votes because of what he had done for them and the country.He gave 10 reasons why Jonathan should be voted again. Some of the reasons, he said, included his non-violent nature; absence of political prisoners in the country since he was elected and his non-discriminatory attitude.Anyim further said that Jonathan did not want his presence to become a nuisance to Nigerians adding that he was also not a fanatic even as he had liberated women, as well as empowered youths and above all, appointed an Ebonyi son as SGF. I am working on my phd, but have a thseis horror story. My husband took my laptop in to have some work done, as it was hiccupping a bit. I was busy at the library when he went to drop of the computer so he was in charge of making the back up cd of my thseis (which was 100 pages in and was waiting to have committee corrections). Well, he lost the cd and the hard drive on the laptop was wiped. Bye-bye thseis.Luckily, I had the hard copies with notes from the committee members. I spent two days retyping the thseis, including all the fun margin and formatting requirements. My husband felt so bad, I mean REALLY BAD. I couldn’t bring myself to be mad at him.Needless to say I keep track of all my stuff now. Love him, but some things are too big to give to anyone else. The fridge sounds like a good idea, speaking from experience, although I don’t think I would make a hard copy of every version, just the big changes.